Is your small business properly set-up to comply with Bill 168, the legislation on workplace violence and harassment? 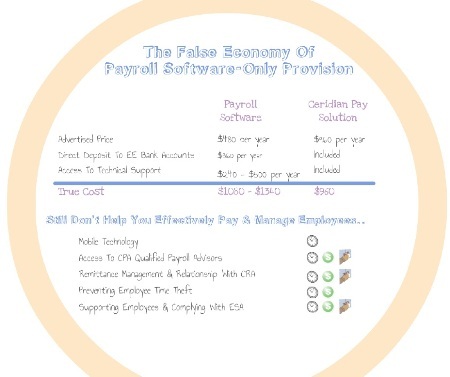 If you’re not sure, perhaps you should consult your online payroll service provider. That’s right, your online payroll provider. Ceridian Canada Ltd. recently rolled out a Web-based payroll service suite called Ceridian for Small Business, which among other things, provides tax and human resources issues advice. The company, which has been associated with mid-size to large businesses, is now going after businesses with 50 or less employees. 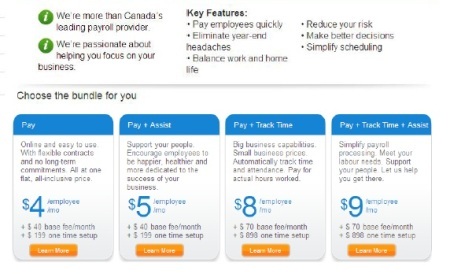 To differentiate their product in the quickly crowding market, Ceridian is offering a range of services that start as low as at $4/employee/month to one that cost $9/employee/month and includes options for on-call HR advice, workforce hiring assistance, and even employee counselling services. Other tools that offer such a depth of functionality are often aimed at large enterprises such as Workday Inc.’s payroll suite which is being used by Thomson Reuters which has more than 55,000 employees spread out over 100 countries. Ceridian for Small Business helps users reduce the time they spend on employee management by up to 40 per cent, Thomson said. The tool also cuts down costs associated with payroll task by as much as nine per cent. According to Thomson many payroll companies start with a low up front fee that gradually increases as user add on other features. For instance, a basic payroll service advertised as $480/year may require $360/year for direct deposit and another $240/year to $500/year for technical support for a total of $1080 to $1340/year. “With Ceridian, these set of services only cost $960/year and you get mobile technology as well,” he added. Business owners or administrators can view payroll calculations from their iPhone, or BlackBerry, or Android phones and either activate or cancel payments. An additional service starting at $44/month enables employers to provide their workers with: cheque payment or direct deposits, electronic pay statements, T4 form generation and access to Canadian Payroll Association certified advisers. A time tracking feature that starts at $34/month enables users automate employee time-in and time out collection and tracking. This reduces labour cost associated with managing monitoring overtime, under time, holiday and vacation day pay and cuts down on “time theft,” according to Thomson. A $1/month feature also provides workers with access to counsellors to help them manage personal issues such as personal challenges like divorce, death or sickness in the family and stress. The service can also be tailored to help workers access appropriate training. For an additional $700/month, business owners can have unlimited on-call access to certified employment advisors and lawyers, that can provide advice on preparing contracts, documentation, termination and other matters that will help the company remain compliant to current labour laws. Job advertisement packages starting at $960/month also includes services such as: job advertisement writing services, job posting services, candidate resume short listing, optional candidate interviewing and optional candidate background checks. Ceridian’s extensive offering is a stark contrast to many of the low-budget SMB-focused products now competing in the market. For instance, Wave Payroll Inc. offers what might be called a bare-bones solution that costs just $3/employee/payroll. Targeted at operations with 10 employees or less Wave Payroll offers the basics such as T4 generation, tax deduction management and other government remittances and calculations for employee vacations, days off and sick days. “Many of the products out there are just too complicated and loaded with features that some businesses may never even use,” according to Scott Zandbergen, Wave Payroll’s vice president for product marketing. PaymentEvolution Corp. of Toronto offers an electronic payment tool that is even free to firms with five or fewer employees. Companies with six or more employees need to pay $18/month with no extra charges for additional employees, according to Sam Vassa, the firm’s operations head. Users also need to pay an extra 50 cents/transaction to have payments electronically transferred to their bank accounts. There are also software alternatives such as Simply Accounting 2012 package offered by Sage Group Plc. The software is designed for SMB users with very little or no knowledge of accounting principles. For instance, visual clutter on the software’s dashboard was reduced and online information that users need to know about are shown. “The screen was really cleaned up and its makes it easier for user to follow,” said Alistair Ellis, senior product manager for Simply Accounting. Ellis said users can instantly switch between paying one employee to paying multiple employees. For payroll advances, the software automatically calculates and withholds amounts that must be withheld to meet Canada Revenue Agency requirements. Simply Accounting First Step sells for $79.99. Simply Accounting Pro is $199.99 (without payroll) and $449.99 (with payroll). Simply Accounting Premium is $399.99 (without payroll) and $649.99 (including payroll). Thomson of Ceridian the idea of offering customers with a long list of options if provide small businesses with a one-stop-shop product that can address their business needs aside from the basic payroll tasks. The challenge many businesses in this sector face is that they are burdened with either high-priced, complicated payroll systems or they have to cobble together multiple systems to address various needs, he said.